The honey bee shortage is a world-wide problem with globally systemic affects. The honey bee affects everyone who depends on eating food from crops. Bees have influence over the animal and plant realm. If the pollination of the plants decreases, other animal populations would soon follow. Nearly 80% of the food we consume that requires pollination is completed by the honey bee. Treasure Valley Bee Rescue is taking a serious stance on improving the quality of bee care. If they are an annoyance to you, consider their value before you break out harmful insecticides. It is best to have the bees removed by one of our professional Treasure Valley Bee Rescue teams. Use of sprays or water can upset the bees and may cause harm to you as well. Bee relocation is good for your home, the county, the country and the world. We will evaluate the bees to see if they are able to rescue them. In bee relocation efforts, if the colony is an aggressive colony, measures are taken to have the hive or swarm re-queened to breed out some of aggressive characteristics. By doing so, the bees settle and are able to be domesticated. 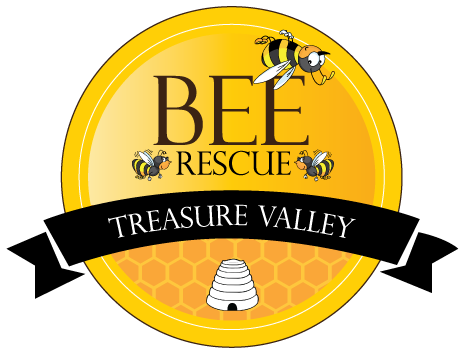 It is highly recommended that you contact a professional bee service such as the Treasure Valley Bee Rescue. Our well trained professional beekeepers are able to eliminate your problem. If you have any question or concern on bee removal or bee rescue, please call us at (208) 602-4881 today, and we will gladly send someone to come assess the situation and provide you with the best options.